If you've been following along with us, you know that we recently debuted our April Card Kit — Jungle Friends. Not only does it include a bevy of fun animals, papers, and Die-namics, this card kit gives you the ability to create really cool slider cards! This week we're going to learn how to create slider cards with the Jungle Friends Card Kit. Today's video will give you a look into how to use the slider elements of the card kit. Stephanie shares an absolutely ADORABLE project, and gives you a how-to with the slider elements that come with the kit. Those Spin & Slide Discs are essential to making a smooth slide. Watch the video below or click here (Jungle Friends Card Kit|Creating a Slider Card) to watch it on YouTube. Don't forget to subscribe to our YouTube channel so that you don't miss a single tutorial! I absolutely ADORE how Stephanie added glitter to the alligator! Just imagine all of the fun things you can dress the animals up with — ink, patterned paper, paint, stamps, layers — the possibilities are endless! Let's take a look at a few examples of other delightful ways to create slider cards with the Jungle Friends Card Kit. I shared this fun card by Francine on Friday's post, but today you can see it in action below. So cute, right? Torico used the giraffe Die-namics from the kit to create her card. Watch the video below or click HERE to watch it on YouTube. The way that the giraffe slides UP goes perfectly with the sentiment. 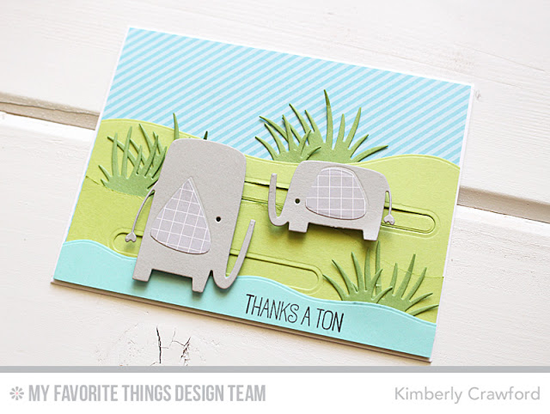 Kimberly created cute elephants in her slider card using the Jungle Friends Card Kit. To see exactly how she did it, you can watch a video on MFTv HERE. You will LOVE the Jungle Friends Card Kit. Once you get your hands on it, we can't wait to see what you create! Be sure to tag #mftstamps when you post your projects online. We can't wait to see what you've made!